Architectura Navalis. Das ist von dem Schiff, Gebäu / Auff dem Meer und Seekusten zugebrauchen. - bound with - Architectura Civilis, Nova & Antiqua. Das ist von den fünff Säulen zu der Baukunst gehörig, wie dieselbige vom Vitruvio, Archimede, und andern alten Meistern auss rechtem fundament in gewisse Lehrsätz und Regeln abgefasset und begriffen - Josephum Furttenbach, Georg Andreas Böckler [Boeckler] 1629 - Johan Saurn, Ulm - First Editions	A stunning, clean and complete copy of Joseph Furttenbach’s famous treaty on shipbuilding, Architectura Navalis with double-page engraved title, title in red and black, twenty stunning double-page engraved plates showing boat design, and various types of boats many engaged in action with other boats and monsters of the sea. Furttenbach was a highly influential German architect, who attempted to cover all fields of architecture in his writings. Böckler corresponded with Furttenbach and his works on architecture were intended to contribute to the rebuilding of Germany after the devastation of the Thirty Years War, his Architectura Civilis, Nova & Antiqua presents a comparative treatment of the Orders [Architectural Styles] and is illustrated with forty engraved plates, woodcut printer’s device and red and black text to title page, woodcut head pieces, and initials. 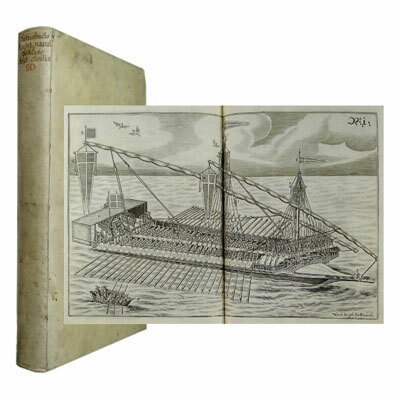 Joseph Furttenbach [1591-1667], German architect, after travelling through Italy he prepared a guide-book for Italy (1626) and made his base in Ulm, where he wrote several important and influential works on architecture, including Architectura Civilis (1628), Architectura Navalis (1629), Architectura Martialis (1630), Architectura Universalis (1635), and Architectura Recreationis (1640). He became director of the Stadtbauamt (City Building Office), Ulm, and designed the Brechhaus (1634), a hospital designed on the latest Italian lines, and a theatre with seats for 1,000 people (1641). Furttenbach introduced High Renaissance architecture to Germany. Georg Andreas Böckler [1617-1687], German engineer, architect and inventor. Little is known about Bockler’s personal life. His father was a Protestant pastor, and a brother was a professor in Strasbourg. 1756 he was a builder at the court of Eberhard III, as the successor of Henry Kretz Meier. He mostly worked to repair forts destroyed during the Thirty Years' War. In 1673 he produced the plans for the Mühlburg castle that was destroyed again in 1689 by French troops. From 1679 he was also a builder for the Marquis of Brandenburg-Ansbach. Nothing is left of Bockler’s buildings, his importance for posterity lies in the numerous books he has wrote: With his Compendium Architectura Civilis, he wanted to build on the knowledge before the war, believing that in this time, in together with the loss of life and buildings, was also lost a lot of expertise, whilst his Architectura Civilis, Nova & Antiqua presents a comparative treatment of the Orders [Architectural Styles]. From the famous library of Christoph Wentzel, Graf von Nostitz [Kryštof Václav z Nostic-Rokitnitz - 1648-1712] with his armorial bookplate and initials (C.W.G.V.N.) - [see http://www.flickr.com/photos/58558794@N07/5594725691/in/photostream/] Kryštof Václav z Nostic-Rokitnitz was a member of the Nostitz family, a famous collector and patron, the founder of the Capuchin monastery in Svídnice. HIs chief residence, a castle in Lobris [Luboradz] was known for it’s extensive library. He served as ruler of various Silesian [Central European] principalities. Named chamberlain of Emperor Leopold I  and then a Czech Count , expanding his control to a large area of Silesia, he later became council and then privy council to emperor Josef I . Later property of the Trustees of Lord Gretton. Lord Gretton is said to have wanted to establish his place in society and bought Stapleford Park, in Melton Mowbray, which he radically changed, adding on a series of reception rooms and further bedrooms. ‘The house finally represented the magnificence of English architecture through the ages and allowed the entertaining of house guests on a grand scale as was common in the Edwardian era. Today Stapleford is regarded by many as one of the finest and most beautiful examples of an English stately home’. References: Kruft History of Architectural Theory 176. Millard III 34. Poggendorff I 819. Schloisser 588. Oxford Dictionary of Architecture & Landscaping.